What is agile software development methodology ? Agile is a software development methodology that instead of sequential waterfall like approach uses iterative and incremental approach to manage projects. Agile is best suited for the project where requirements are not fully known at the start of the project but evolve as project progresses. As is the case with many, if not, most of the IT projects, requirements changes rather quickly because of customer needs, market demands or some other factors which makes agile ideal methodology to run the projects. Agile handles uncertainty and change by creating and presenting working product to the customer in short and frequent intervals called iterations or sprints. Contrary to Waterfall where change is not always welcomed, agile welcomes change and provide an adaptive framework to deal with the change. Agile also empowers by letting team members choose their own tasks. Agile comes into different flavor to manage project methodologies such as Scrum, XP, FDD, Dynamic System Development Method (DSDM) and Kanban. 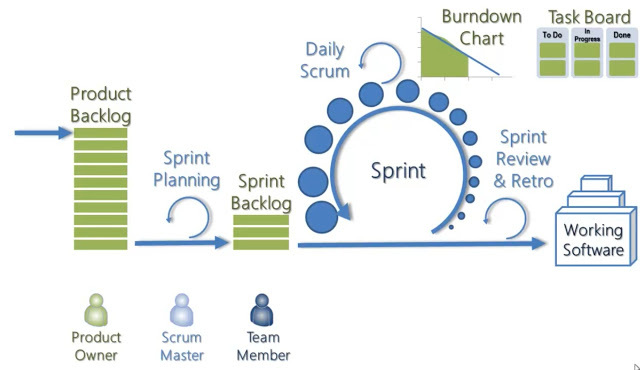 Scrum is the most famous and widely used agile methodology. In agile methodology, Project managers role change from authorities and controlling figure to more of a collaborating figure, where PM does not dictate teams to what to perform and how to perform rather PM acts as a servant leader who keeps track of the project, removes the impediments and is responsible to hold activities and meetings that in return help to keep project progress in check. In agile environment, teams are more empowered. Team members choose their work give estimate to complete the work themselves. PM still manage and keep track of the progress of the project and act as a facilitator to the team.